Have you ever painted your nails and left that dark red nail polish on for way too long? If yes, it is highly likely that your nails underneath now have a yellow tinge. The thing about nails is that they can get discolored easily because of excessive use of nail polish or vitamin and mineral deficiencies. Discolored nails certainly don’t look pretty and, to be honest, they can be a real embarrassment. Thankfully, there are plenty of inexpensive, simple at-home treatments that can help you whiten your nails in times of crisis. If you’re looking for economical, DIY solutions, keep reading! Note: Nails often reflect our general state of health. 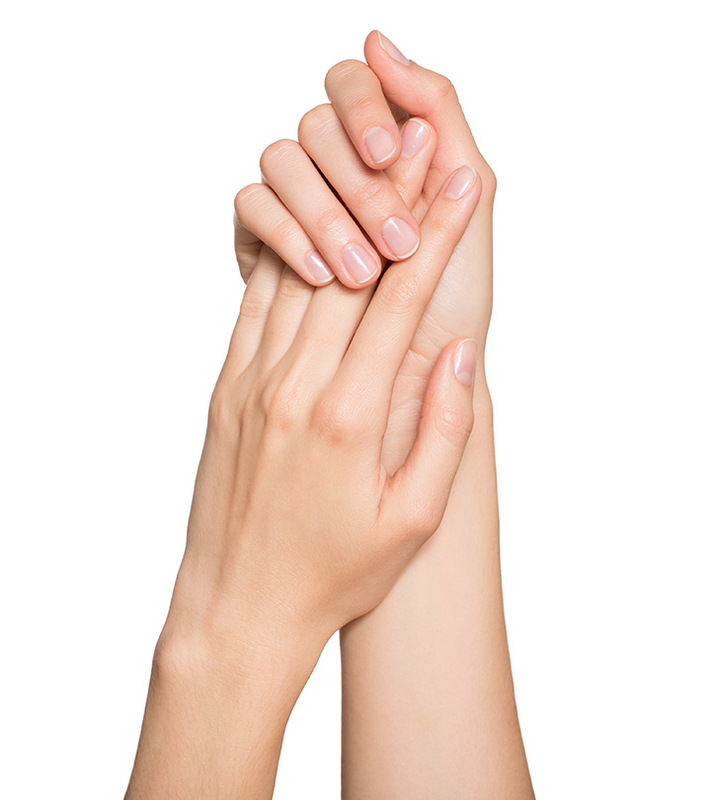 Changes in your nails, such as discoloration, can signal serious underlying health conditions. Therefore, if you can’t figure out why your nails are getting discolored, it is advisable to get them checked by a medical professional. Yellowing of nails is both common and unavoidable with regular nail polish use. It is especially common when you use dark hues like reds, purples, blues, and black. If you can’t break up with your polish, we recommend you to get into the habit of prepping your nails by using a base coat every time you paint your nails. A good base coat creates a stain-proof barrier between your nails and the polish. But, if the deed’s done and you skipped the prep in a rush, don’t worry because we’ve got you covered. 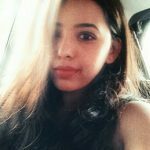 Given below are five effective techniques to whiten your nails. Most of these ingredients may probably be lying around your house already! 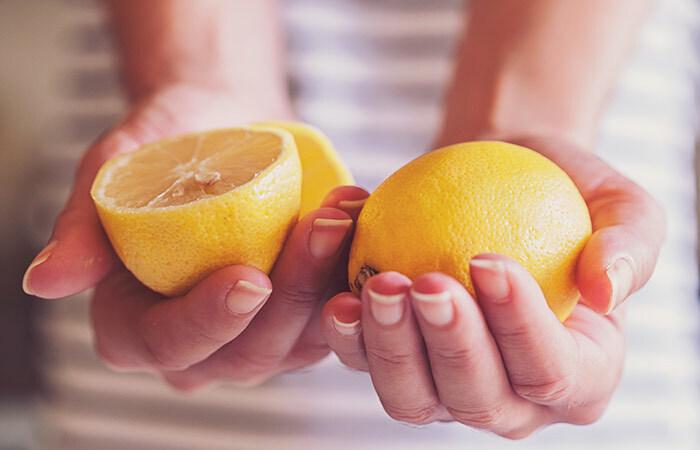 According to nail experts, mixing lemon juice and baking soda creates a powerful cleansing paste for your nails. It works instantly to whiten and brighten dull, discolored nails. Step 1: Squeeze half of a lemon into a plastic bowl. Step 2: Mix in the baking soda until you get an abrasive, paste-like texture. Step 3: Apply the paste to your nails and let it sit for 10 minutes. Step 4: Use an old toothbrush to scrub your nails with the paste. Step 5: Rinse your hands with mild soap and water. Tip: If you don’t have baking soda, combine salt and lemon juice as an alternative. Salt acts as a gentle buffer, and when you mix it with lemon juice, you can get rid of practically any stains. Whitening toothpaste is the easiest way to get your nails ramp-ready. Some toothpastes contain baking soda and peroxide that work together brilliantly to fix that yellow tinge on your nails. Step 1: Start by buffing your nails until they look shiny. Step 2: Apply a thin layer of the toothpaste to your nails and let it sit for 10 minutes. Step 3: Use an old toothbrush to scrub your nails gently. 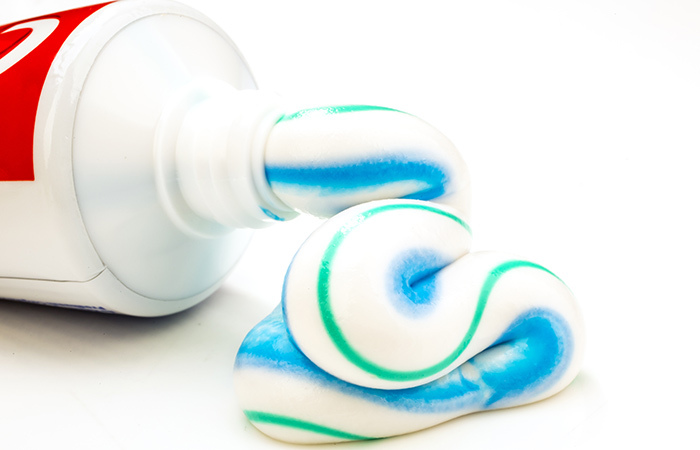 Step 4: Remove the toothpaste with the help of cotton balls soaked in water. 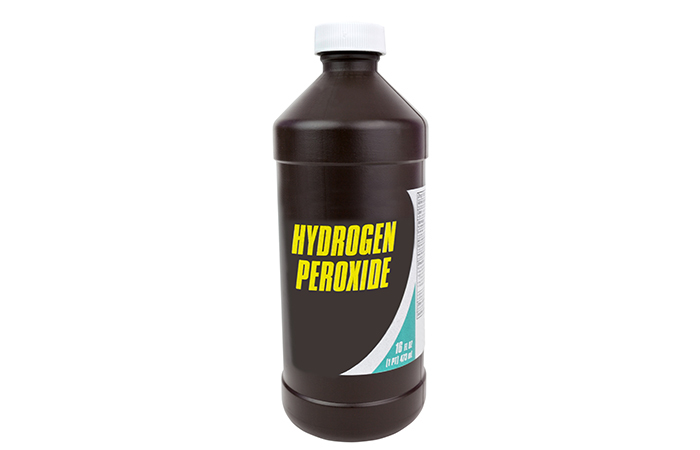 A diluted solution of hydrogen peroxide works like magic to lighten and whiten nails. All you need to do is create a soak. We assure you that it is the most effective stain remover in existence. Step 1: Mix one teaspoon of hydrogen peroxide and one tablespoon of baking soda in a plastic bowl. Step 2: Add half a cup of water and mix the ingredients until the powder dissolves. Step 3: Soak your nails in the solution for about 10 minutes or until the stains disappear. Step 4: Rinse your hands with lukewarm water. Step 5: Slather on some lotion. Voila! Your nails should be clean now. Soaking your nails in a denture cleaner also works efficiently to get rid of stains. 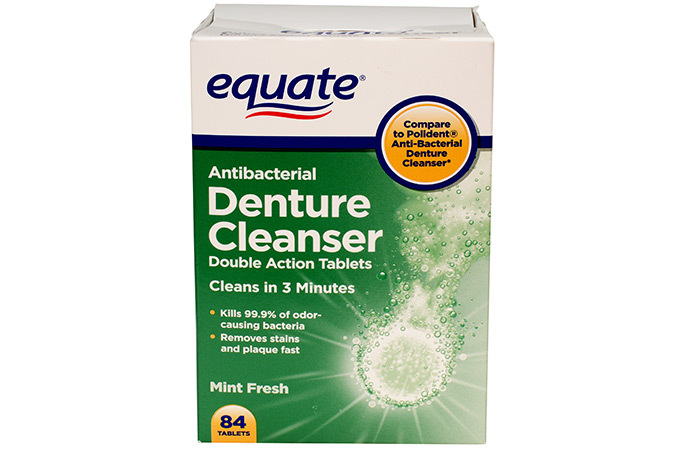 Denture cleaners contain dilute sodium hypochlorite that works as a mild bleaching agent. Step 1: Add one denture cleaner tablet to a dish of warm water. Step 2: Once the tablet dissolves in the water, soak your hands in the solution for about 10 minutes. Step 3: Rinse your hands with warm water and pat them dry with a clean towel. Step 4: Follow up with a moisturizer, and you’re good to go! 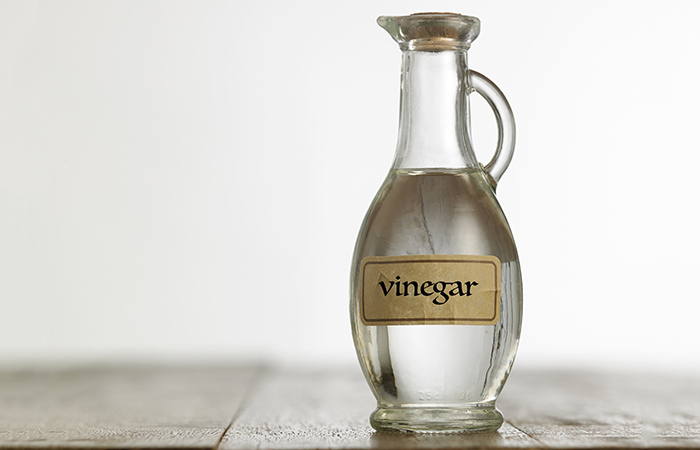 Vinegar is another mild acid that can strip stains from hard surfaces. However, you should only use white vinegaras other kinds of vinegar can stain your nails. Step 1: Pour one cup of warm water into a bowl. Step 2: Add one tablespoon (5-10 ml) of white vinegar to the water. Step 3: Soak your nails in the solution for 10 minutes. Step 4: Rinse your nails with lukewarm water and pat them dry with a towel. Step 5: Apply lotion to your hands to prevent your skin from drying out. Take a close look at your nails. Do they look strong and healthy? Your nails offer a glimpse into your overall health, which is why proper nail care is very important. If your nails have discolored or turned yellow (thanks to you never giving them any breathing time), these DIY methods will come in handy for you. But, if you can’t figure out why your nails look so sad and discolored, it is best to steer clear of these concoctions until you get a proper diagnosis and treatment. Try out these nail whitening techniques and let us know about your experience in the comments section below!